Everything you thought you knew about Maya Joint Orient is wrong! ***We will be updating this document and also we will start with directing you to watch over the great breakdown of the good bad and ugly of the Joint system in Maya. Most of what is discussed and the core reasons behind what is shown is really an important understand. A few notes before we update this document in the near future. Yes technically you can ignore the orients if you are simply using the joint as a deformation node and the rigging system deals with everything else. There are times you can ignore/it doesn’t matter for a deformation system skeleton what the Rotate Order is…rotate order isn’t directly tied to Joint orient but they are related but General rotate order understanding is on all transforms, not something limited to joints. You will want need to know how to edit and work with the orients if you are working with Maya tools like IK chains or you are using them in your control system. The root joint of the character is positioned at the origin of the scene at 0,0,0. The root joint of the character is oriented to z-up and y-forward. The Joint Orient attribute for the root joint is set to -90, 180, 0. A SceneRoot node exists for your scene. If this node does not exist, create it by choosing Tools, Add Scene Root. If you use Lumberyard’s integrated IK system, you must set up joint orientations the same way. In addition, the naming of the joints must match those defined in the .chrparams file. New animation system in LumberYard -Better support for FBX and because FBX and MotionBuilder does read and allow for orients and rotate orders keep in mind that those settings can affect the application of code on the engine side. Check the bind pose before exporting your skinned mesh. For example, if the mesh moves after unbinding, you must reskin the mesh in order to prevent any errors in Lumberyard. Ensure that your skinned mesh has one bind pose in your DCC before you export to an .fbx file. We will do a more detailed update and also breakdown our understanding and counterpoints to what is shown from Raf that we might still have a diffrent view on or want to clarify, stay tuned. Again, a heartfelt thank you to Raf and the @CultOfRig for exploring this topic and helping move things forward the base level of rigging understanding, anytime you can free yourself from past limitations or ideas and improve your ability to make mindful choices, it is a good thing. A rig is the animators pencil, as such it has to allow the animator to get from pose A to B with out freaking out (aka wobbling). It should also be editable from the graph editor to create predictable results during the polish pass. None of this is possible without firstly setting up a clean skeleton with proper joint orients (how the joints aim) and secondly, controlling the order that Maya applies the EULER rotation animation to the transform node (rotation order). The Maya Joint Orient Problem! or Why you should care about Joint settings? We at Rigging Dojo would like to warn you of a debilitating issue that could be lurking in your rigging pipeline at this very moment. What is this silent danger you ask? BAD JOINT ORIENTS!!!! Spooky, we know. It is the silent and hidden destroyer of all animation including ik/fk switching issues, pole vector problems, gimble lock and much more. The worst part is, you may think you are immune to such a terrible issue. You think to yourself “I know what I am doing” or “I am experienced” or “I work a big studio” or even that “I helped write Maya”. But as we will show none of these matter, you can still be infected. It infects 99% of Maya rigs, especially legacy assets. How do we know? We’ve been fixing these problems in rigs across a wide range of studios for years, and we started off like you creating bad skeletons. We’ve been lucky enough to work with a lot of students over the last five years at Rigging Dojo and this is the number 1 rigging issue that almost every student has struggled with in Maya. We’ve seen it cause endless frustration for artists. Especially people new to Maya, who are familiar with 3dsMax and XSI bone based systems. Animators also are on the receiving end of this often succumbing to fits of rage when they just want to animate their rig without it breaking or do something simple like cleanly switch from IK to FK and back. Maya joints visually let you think an arm or leg or finger is “planar” but in reality the joint orients (how they aim at the next joint) might be all jacked up. Lets dig in deeper and get to the bottom of all this, keep reading so this doesn’t become the look of your animation department. 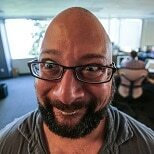 Tim Borrelli – animator just finding out his rig is broken and all the animations need to be redone. 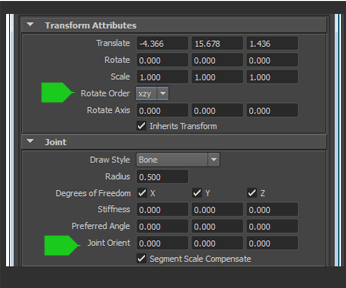 Maya Joints have extra hidden transform values compared with regular Maya objects. *Note: there is an option on a joint and in Maya to, by hand, select and rotate the LRA and this shows up as values in the “Rotate Axis“. This is not recommended as a way to edit or adjust the joint aim. This doesn’t export out of Maya correctly, it creates yet another layer of offset on the joint and can still create unstable skeletons even if your Joint orient looks sound. In summary, don’t touch it! The first question we usually get when teaching JO is “do the Maya tool defaults matter when creating the joints”? For example depending on how you draw the joint Maya will flip the axis based on the angle of the next joint anyway. JO always has to be oriented after, for each joint depending on how it was drawn. So we never care what the defaults are. The next question we get…why are some skeletons Y down the joint, some X, does it matter, one tutorial said do it this way, how should I do it? Answer = legacy, it doesn’t matter, pipeline, software choice. Note: Spline IK solvers as of Maya 2015 still require X down the joints for the “Advanced Twist” settings to work as well. To expand on this the next question comes as “what do we do about the other axis, what way do they go”? Answer = Don’t care, doesn’t matter, do what is required..
Why? The direction of axis only matters for consistency of how you want the values to work for animators and your own sanity hooking up rig bits -+. Consistent action and expectation matters only, make + bend things – straiten things or switch it, much like aim axis (X down) legacy, pipeline, software used etc will have some say in the matter. Once we understand that the direction of the joint doesn’t matter at all, the choice is arbitrary you might think that is all you have to do…aim the joints orient them and move on. But we have to pay attention to the rotation order if we change the defaults. Think of every rotation order setting like a traditional parent child hierarchy except hidden in the joint node. When you change the order of what rotation axis is used first, second, and third: just imagine you are behind the scenes, re-parenting that hierarchy. Like a simple hierarchy of nodes. As we come back to the “do defaults matter” question, while we said no they don’t, lets explain why they are the way they are. The defaults for rotation order are XYZ because, X (rotates last) and is default for a joint that also defaults to X aiming down the joint (twist). If it was any other order then the joint would wobble instead of twist cleanly once animated. So if you leave defaults it is fine, chose to not put x down fine pick y? Then you need to set the twist axis rotate order also to YXZ or YZX. We know you might think this is crazy and out of hand and maybe even to much talking about this, but here we get to the real problem. Maya has no tool that can work for joint orients on skeletons that are not world aligned. None! You might think you can just use the Maya orient joint tool or some other tool to easily fix this and you would be half right but.. Where Maya joint control breaks down is the fact that while visually you think an arm or leg or finger is “planer” the joint orients might be all jacked up making animation, IK snapping/pole vectors freak out and extra work for everyone, as we stated before. What does that mean- Well, if you draw joints in an A pose or snap mesh center,run an auto rig /skeleton on Mixamo – the reality is no matter what it looks like, you will NOT have and can’t get planar clean joints at elbows and knees. You can not fix it with the orient joint tool. You have to rebuild the chain and jump through hoops to fix this all because Autodesk will not update their internal orient code to use parent space vs world space for the Up vector setting! There are some scripts that can help you but if you are on a skinned mesh you have to save your weights, delete the skin cluster and reskin after you fix the orients. Now you know the problem, you understand the tools and joint settings and options, lets look at best practices to vaccinate your rigs. We want to help and teach you to identify the symptoms to vaccinate yourself and your pipeline from this problem, with this simple visual guide and this lengthy post. Root/top joint – this is a world space joint and for biped characters often we want them to be stable as they turn around and move through the world it is best to have it alined with the world and it has a rotation order (RO) that matches the global orientation. Y being the master then either x or z (zxy or xzy). Top level joints can have joint orients in all axes. Areas where chains split are considered top level chains. For instance, hips, clavicles, finger. Rotations always need to be zero – regardless of where the joint is. Subsequent children in chains have translation and jointOrient values in only one axis each. So elbow, wrist, knee, finger[1-x]. 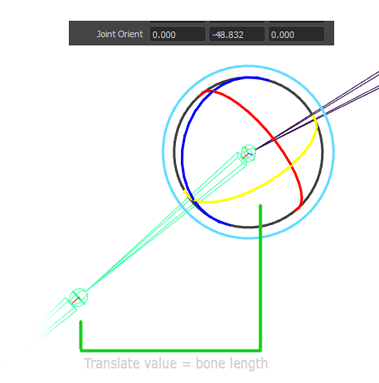 One translate value for child nodes in a single chain- because Maya doesn’t use bones that have length, this translate value is the “bone length” from parent joint to child joint. End joints (dummys, ends,null bones)- last joint in a single chain may or may not be used in the rig, are often there for visual length but we always set them to an orient of 0,0,0 and that means they align perfectly with the parent joint. If you would like a video that covers a practical example of these concepts and will scale to cover joint placement and orientation across all parts of a character. Rigging Dojo Course sneak peek 101: Thumb Joint and Finger Joint Placement from Rigging Dojo on Vimeo. Future exploring and reading can be done over at the Maya rigging wiki that is run by the talented Amy Hay (Alumna) and curated by Rigging Dojo. Already have a skeleton that needs fixing? Here is our handy infographic guide to clean skeleton building. Epic insight into joints. Thanks! I really like the image of 3 stacked transforms to visualize rotation order. I never thought of doing that, and usually just experiment and wiggle the controls until it works properly. These are things I’ve learned after the years. People always asked me why I took forever with rigs and this is why. I was making sure rigs were SUPER CLEAN! Starting with the skeleton. Nice article, and I couldn’t find any good scripts to make this easy to fix. Excellent! Thank you for both enjoying the article and taking action and writing and sharing back the script, we shared it on Twitter and Facebook. I’m having some issues getting the coplaner joint orient tool working Ilya. In Maya 2014 it looks like the api call to MPlane returns a AttributeError: ‘module’ object has no attribute ‘MPlane’. In Maya 2016 I see a syntax error in PlaneMode.py. Are you doing something to your custom environment? I will keep digging around as time allows to see if I can pull up more useful information. It looks like I have it working in 2016 now with no modifications by tweaking some of my own environment. 2014 is still a bust. I will take my comments to Github as I play around with this. Good stuff. Thanks again for writing it, Ryan let us know what you find. Oh yeah I know it works in 2016 for sure. I used the 2.0 version of the Python API. Maybe I should use 1.0 since just in case in a future update. I think all it takes is changing which imports and libraries I’m using.